Motorola is giving a stiff competition to Samsung by reintroducing itself in the Smartphones market offering Moto range at a price that no one thought. Head to head comparison of Samsung galaxy grand prime vs Moto g.
Moto G comes with a 5.0 inches (68.9% screen-to-body ratio) IPS LCD capacitive touchscreen with a resolution of 720 x 1280 pixels (294ppi pixel density) and with Corning Gorilla Glass 3. In terms of display Moto G is more vibrant and beautiful than Galaxy grand price. With a corning gorilla glass makes Moto G highly protective and secure. Galaxy grand prime comes with a Quad-core 1.2 GHz Cortex-A53 Qualcomm MSM8916 Snapdragon 410 processor which makes it efficient and effective for multitasking. Moto G comes with a Quad-core 1.2 GHz Cortex-A7 Qualcomm MSM8226 Snapdragon 400 processor which again is an efficient and effective for multitasking. There is not much difference in the processor so both are equal having powerful Quad-core processors. Galaxy grand prime comes with a running Android OS, v4.4.4 (KitKat). Moto G comes with a stock Android OS, v4.4.4 (KitKat) which is upgradable to Android Lollipop. Both Galaxy grand prime and Moto G comes with a 1GB RAM which is sufficient to enjoy 3D games and watch HD videos & movies. Both these phones allow you to open and line up several apps at the same time. Galaxy grand prime comes with a 8 MP, 3264 x 2448 pixels Rear Camera with autofocus and LED flash. You can enjoy HD video recording at 1080p with features like touch focus, Geo-tagging, face and smile detection, and panorama shot. Samsung has provided a 5MP front camera for its customers to take a high quality selfie and record HD video at 1080p. Moto G also comes with a with a 8 MP, 3264 x 2448 pixels Rear Camera with autofocus and LED flash with features like face detection, HDR, touch focus and panorama shot. You can enjoy HD video recording at 720p. There is a 2MP camera which is not so effective but produces good quality selfie. In the segment you can see Motorola can’t beat Samsung whether it is a front camera or the rear Samsung is far better than Motorola. Galaxy grand prime come with a removable Li-Ion 2600 mAh battery while Moto G has a Non-removable Li-Ion 2070 mAh battery. Both the phones support dual SIM but Galaxy grand prime support GSM / HSPA / LTE whereas Moto G supports GSM / HSPA. This gives an advantage to Galaxy grand prime in the 4G LTE network. But if you see the higher version of Moto G it comes with 4G LTE technology. 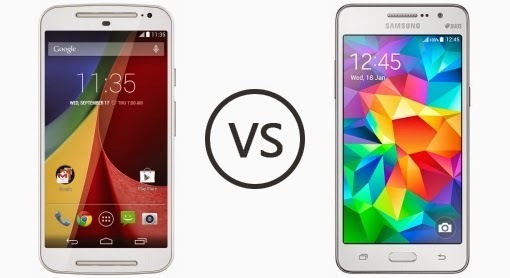 This comparison of Samsung galaxy grand prime vs Moto g would help you in healthy buying.